Feast on stodgetastic dishes such as steak pie with chips and gravy, jacket potatoes and classic fry-ups at this old-school London caff. Behind its black-tiled art deco exterior, this classic caff has operated on the quiet Westminster/Pimlico borders since 1946. Customers sit on brown plastic chairs at Formica-topped tables, watched over by muscular boxers and Spurs stars of yore, whose photos hang on the tiled walls. Lasagne, omelettes, salads, baked potatoes, every conceivable cooked breakfast (the chunky bangers are especially fetching) and mugs of tannin-rich tea are meat and drink to the Regency. Stodgetastic own-made specials include steak pie – the thick pastry hiding tender meat in a tomatoey sauce, served with serviceable chips, thick gravy, and peas that might well have seen the inside of a tin. Still hungry? The improbably gigantic cinnamon-flavoured bread and butter pud will see you right for the rest of the week. Without over-intellectualizing a fry up, what I love most about Regency is its honesty. Great food, fairly priced in a great setting. Suspect this place has hardly changed in 50 years and there's something about that that's a little bit wonderful.Can't wait to go back. This place is the absolute BOMB! I used to live about 200m from this cafe, and was a regular on a Saturday morning. Note to non-regulars, it's closed on a Sunday (I know, wtf). 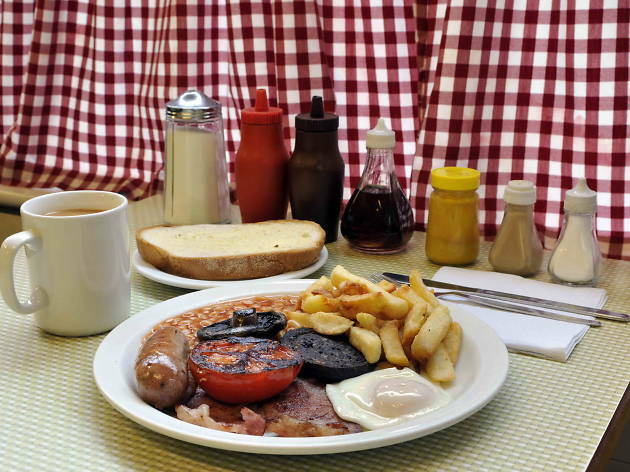 Breakfast is just over a fiver but includes tea and a serious feed. Watch out for the quite scary and loud boss man and boss woman who shout at you to collect your breakfast from the counter when it's ready. My favourite screech from him so far: "Hey Ben, are you going to come and get this or shall I fax it to you?" Rudeness meets brilliance, this place is one of my ultimate favourite spots in London. Only wish I still lived close by. Just how a cafe should be! Top class! Not just the best café in London but one of the best restaurants too. 6 out of 5 stars. Best breakfast in London - Marco is a legend, always smiling and happy to see you. Five Stars. Bloody good fry up here. Fab cafe - best in London! 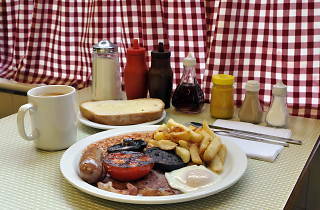 Delicious fresh cooked food for breakfast or lunch is always value for money and served with good humour. It is what it is. A simple cafe offering normal food at reasonable prices.And it does it very very well. Set your expectations at the right level and this place will never fail to satisfy. Maybe the best way to describe it is this - it is perfectly balanced. First and foremost, I'm very proud of the staff, I think they showed great vision throughout my meal. The concentration was certainly very important, they have some wonderful technicians at the Regency Café. As I said, they showed enormous character when my meal was called out, the meal was terrific as I had the eggs, bacon and chips. I must speak with the owners, because they're very important here at the Regency Café. I think they showed a lot of faith in allowing me to come in and do whatever I want for three hours, but towards the end I got a bit worried because a german fella called Jürgen came in, and the owners asked me to leave. I didn't though, and stayed for another 3 hours doing nothing at all. All in all, lovely character and would come back again. 5/5.